Join the discussion on our forums! Come discuss Onyx Bishop over in our dedicated Onyx Bishop discussion topic. Battlecry: Summon a friendly minion that died this game. B4 is a nice place to visit, but he wouldn't want to live there. Hey, those of you that play Big Priest, do you run this? Or is it too random for the deck? You don't run this because it can be rolled from Barnes or Shadow Essence. Why is this not played? If it summons a 1/1 it's a 4/5 at worst. Only reason I see not to is because "muh doomsayer"
Most people were a little bit underwhelmed at first when they saw this card, but it turned out to be an excellent one. Resurrect is a card that asks you to build around it. As such, being able to essentially include four copies of it instead of two makes it significantly easier to justify making a deck just for it (one that avoids minions like Northshire Cleric, Museum Curator, and Doomsayer). It just had to be random. Why couldnt they just make it a little more expensive and let you chose a minion (maybe a dragon or a minion below 5 mana). RANDOM DOES NOT EQUAL FUN! 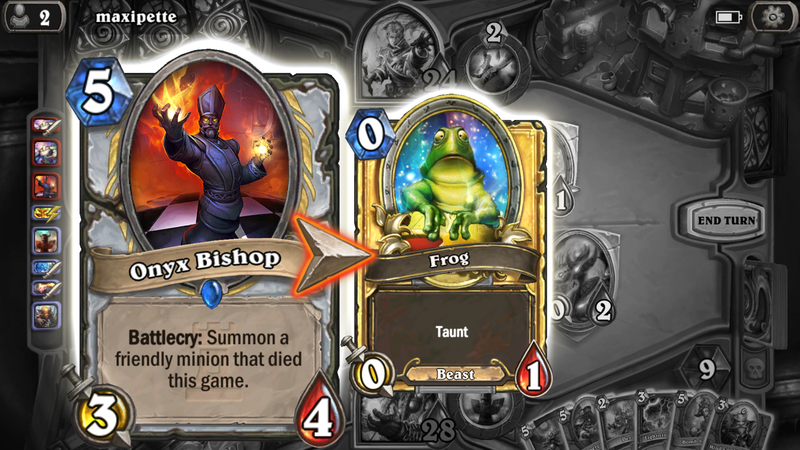 Turn 7: Onyx Bishop, Lesser Heal opponents face, but it's too late because they conceded. And this combo happens once in about 200 matches, how great! This card is meta-defining. Having four resurrect effects instead of two is a world of difference. Until brm rotates out, then both this card and dragon priest die. Leaving only uh.....purify priest? "I have no time for games!" Turn 10 Mind Control Deathwing, Dragonlord, opponent Execute it, 2 Onyx Bishop drop 2 Deathwing back. Jesus RNG. Its really good for control priest. Overpriced? Sure, but you wouldn't be able to play this early and maximize its battlecry effect anyway, although it would be nice to play it one or two turns earlier for the tempo swing. As already mentioned, it is a 3-mana vanilla body + a Resurrect. Not very exciting. 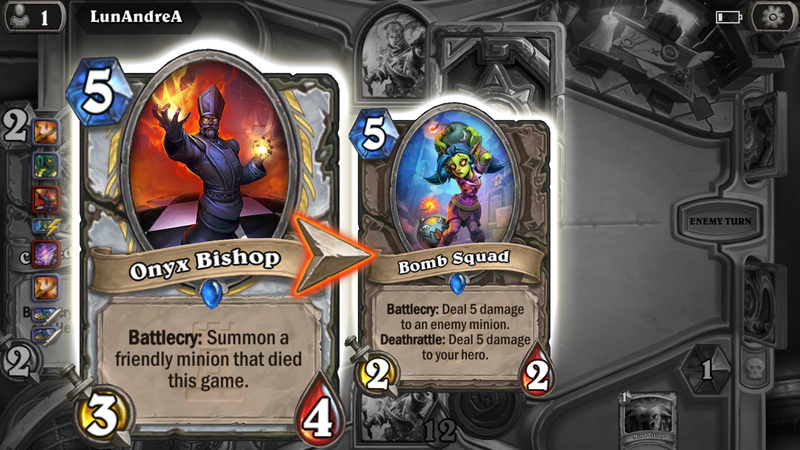 There is a minor upgrade tho, against that combo: Bishop is only 1 card. It requires 1 card draw, instead of a real resurrect spell + a minion. Not overwhelming, but good for thinning up a deck and optimise draw power. 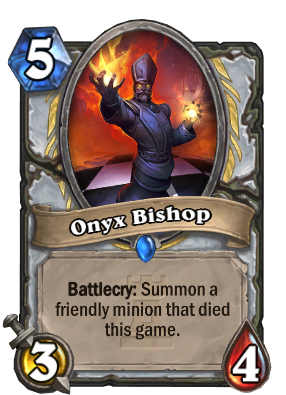 Actually this card is quite good..Andoran shows us that ressurect priest can deal with today meta and another 2 ressurection can change the board very quickly. We shall see. Artwork is so damn ugly - even in gold. you don't like golden animation?